The government should consider imposing "direct rule" on British overseas territories and dependencies if they do not comply with UK tax law, Labour Party leader Jeremy Corbyn has said. A huge data leak from Panama-based Mossack Fonseca showed the law firm registered more than 100,000 secret firms to the British Virgin Islands. Mr Corbyn said their governments must understand the "anger" of Britons. Downing Street said the UK was "ahead of the pack" on tax transparency. What are British overseas territories and Crown dependencies? Eleven million leaked documents showed how Mossack Fonseca clients were able to launder money, dodge sanctions and avoid tax - the law firm says it has operated beyond reproach for 40 years. There are links to 12 current or former heads of state in the data, including dictators accused of looting their own countries. Leaked files also mention UK Prime Minister David Cameron's late father, Ian, who used one of the most secretive tools of the offshore trade after he helped set up a fund for investors. Downing Street sources told the BBC Mr Cameron did not have any shares in Blairmore Holdings, the Panama-based company Ian Cameron helped set up in 1982. 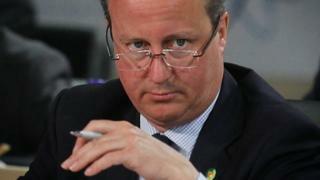 The sources are not saying that other members of the Cameron family do not own shares in the offshore firm, however. A number of British overseas territories and Crown dependencies are named in the files raising the question of what the UK can do about them. These are self-governing territories which rely on the UK for international relations and defence, but their autonomy can be removed, as in the case of the Turks and Caicos Islands. The UK government imposed direct rule on the Caribbean islands for three years after evidence was found of widespread corruption among the ruling elite. It was only after the Turks and Caicos government implemented rules around sharing tax information that home rule was restored in 2012. Media captionLabour Party leader Jeremy Corbyn: "This is money that's taken from our health service, our local services"
Mr Corbyn said the territories, including the Cayman Islands and the British Virgin Islands, were encouraging tax avoidance on "an industrial scale", to the detriment of public services in the UK. He has called for an independent investigation into the tax affairs of all Britons linked to the Panama papers, including Mr Cameron's family. Asked if direct rule was the solution, Mr Corbyn said: "If the local government is simply going to condone this level of... tax avoidance and tax evasion of money that has been made in Britain... then that's something that has to be considered. "They're not independent territories. They are self-governing, yes, but they're British Crown dependent territories. Therefore surely there has to be an observance of UK tax law in those places," he told the BBC. "If they've become a place for systemic evasion and short-changing of the public in this country then something has to be done about it. Either those governments comply or a next step has to be taken." He said if the government decided to impose direct rule, it could be done "almost immediately". Former Business Secretary Vince Cable, a Liberal Democrat, said: "We can't send gunboats these days but we can take the small territories under direct rule." Tax havens: What are they and why do they matter? Two broad qualifications for being a tax haven are to have a low or zero rate of income tax and guarantee the rich a cloak of secrecy they would not receive in their own country. They matter because of lost revenue - it is estimated that UK tax authorities could be losing up to £7.2bn a year from avoidance and evasion. They have also been used to cover up criminal activity. Dominic Grieve, former Conservative attorney general, said removing self governance in overseas territories was a "bit of a nuclear option" and the consequences on the people and their economy needed careful consideration. If havens in overseas territories were shut down, people would go elsewhere where there might be far fewer regulations which would encourage the money laundering and criminality we want to suppress, he told BBC Radio 4's Today programme. Geoffrey Robertson QC, an international human rights lawyer, said: "The British Empire has shrunk largely to a number of tax havens - treasure islands, as they are known. "Britain is at the heart - the hub - of international tax avoidance by allowing these little remnants of empire to have tax secrecy laws and enable offshore trusts and offshore companies to operate without transparency." He said change could come with "some form of international convention" to require transparency, lawyers reconsidering their ethics and an international enforcement body able to inquire, inspect and punish. Since 2009, many attempts have been made to crack down on abuses. More than 700 tax transparency deals have been signed globally. Places including Switzerland, the Channel Islands and Luxembourg have tightened the rules, but Panama and the British Virgin Islands are among those criticised for not doing enough. Next month, Mr Cameron will chair an international summit in London on tax avoidance and evasion, where the use of offshore tax havens to escape scrutiny will be high on the agenda. Downing Street said three things had been asked of the British overseas territories and Crown dependencies - the automatic exchange of tax information; a common reporting standard for multinational companies and central registries so people know who really owns companies. "They have all delivered on the first two so now they must deliver on central registries," a spokeswoman said. "Gibraltar, Bermuda and Jersey have already done so. We are close to agreement with Guernsey and Isle of Man. Now we have to get the Cayman Islands and British Virgin Islands over the line and we are determined to work with them to do so by the time of the summit in May." In 2013, Mr Cameron was quoted as saying: "I do not think it is fair any longer to refer to any of the overseas territories or Crown dependencies as tax havens - they have taken action to make sure that they have fair and open tax systems." HM Revenue and Customs said it has brought in more than £2bn from offshore tax evaders since 2010 and introduced new criminal offences and higher penalties. In a statement, it said: "There are no safe havens for tax evaders and no-one should be in any doubt that the days of hiding money offshore are gone. "The dishonest minority, who can most afford it, must pay their legal share of tax, like the honest majority already does."